This green tea smoothie recipe will give your body a boost of healthy antioxidants, and it’s absolutely delicious, too. This yogurt based smoothie is packed with tropical flavor! Do you make New Year’s resolutions? Does it help you to stay motivated to set goals for the coming year? Often times, New Year’s resolutions are short-lived. When desired results aren’t quickly achieved, self-doubt and feelings of discouragement tend to set in. One way to help prevent sinking back into old habits or veering off the desired path, is to set smaller monthly goals that are simple to obtain. Your monthly goal can be anything from gathering your family around the table for a sit-down dinner an extra night per week, to adding in 30 minutes of extra exercise a few days a week, or swapping out your processed breakfast cereal with eggs and fruit. Make these smaller monthly goals a stepping stone to your bigger yearly goals. At the end of the year, you’ll have found that those goals weren’t so difficult to achieve when change is gradual rather than a “all or none” mentality. During our New Year’s Day dinner, we each took turns sharing a few goals that we wanted to achieve for 2015. My daughter wants to run a few races as a family, my son wanted to win a few swim races and continue to work hard and make good grades in school, my husband wants to improve his eating habits and build more strength and endurance and I hope to improve my flexibility and do more advanced meal prep for the week. Writing down goals, keeping them within reasonable limits and making gradual changes is a good way to improve your lifestyle habits. Record your yearly goals and make a monthly “action plan” to get you there. This sets you up for success and will certainly get you on the path to optimal health and happiness! Here’s to an amazing 2015! Here’s a refreshing green tea smoothie recipe to get your new year off to a healthy start. Place all ingredients into a blender and blend until smooth and creamy. Garnish with a sprinkle of nutmeg or cinnamon, if desired. *This post is sponsored by Stonyfield. I will be trying this out to help with my new years resolution to easy better breakfast! Glad you love it, Emily! I bet it would be great with the green vanilla powder! Yum!! 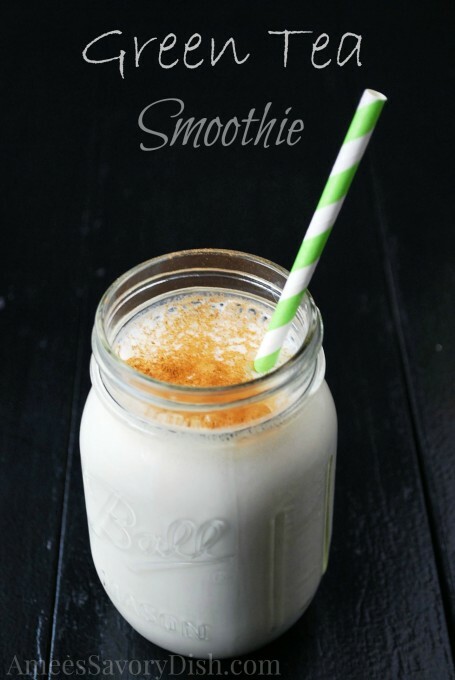 I don’t like the taste of bananas in smoothies (it overpowers everything) so is there anything I can replace it with or would it be ok to leave out? Erin, you can just leave it out and add a little more of another fruit used in the recipe. It adds sweetness and makes it a little more creamy.